This chapter investigates the impact of the Casati Law (1859) on the development of Italy’s national school system before the Fascist era (1861–1922). Unified Italy inherited large regional education disparities: Literacy rates among children ranged from 60 percent in the northwest to 10 percent in the south. The Casati Law aimed to provide for a uniform education system; however, the funding and management of primary schools were left to the municipalities. 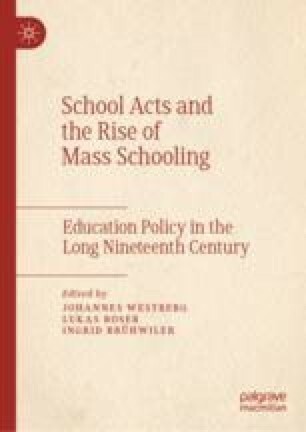 The analysis shows that this arrangement hampered regional convergence and the diffusion of schooling within the country. When the system became more centralized in 1911, literacy rates started to grow more rapidly and to converge across regions. Despite this convergence, Italy’s comparative human-capital disadvantages and educational regional inequalities have persisted to the present day. I gratefully acknowledge financial support from the Spanish Ministry of Economy, Industry and Competitiveness, project HAR2016-76814-C2-1-P (AEI/ FEDER UE), and from the Swedish Research Council, grant no. 2016-05230.